Drinking Coffee in the morning are many people routine that essentials in those people daily life. Coffee are drink not only because they are taste good but the caffeine content in coffee also makes people feels more awake and energized. You can find many different coffee available in the market, whether in instant, ground coffee or pre-ground coffee, which you can prepare easily at home. For those who feels the need of a cup of coffee in their morning routine, let us introduce you to Folgers and Starbucks ground coffee, which are famous and loved by many people. Folgers is a brand of coffee ground based on the United States and a part of the food and beverage division of The J.M.Smucker Company. The company has been one of the bestselling coffee ground company since early 1990s. 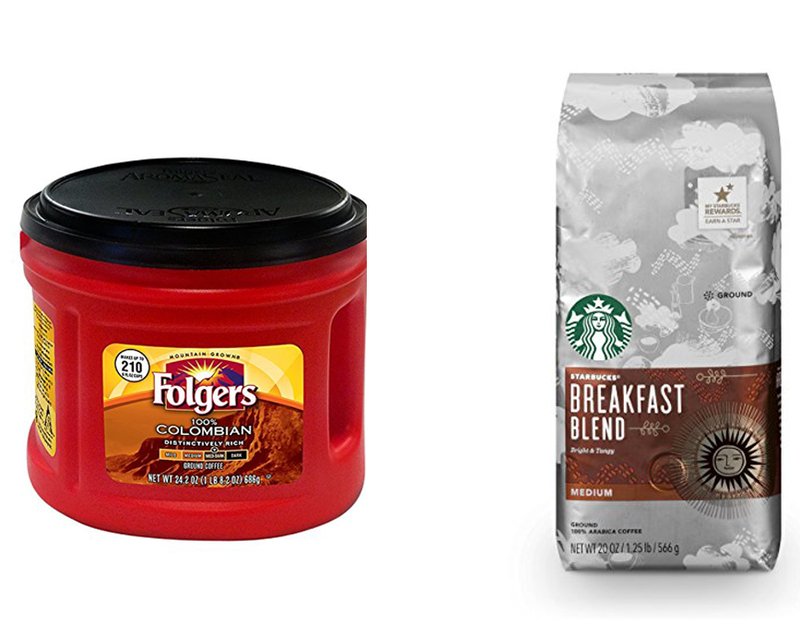 Folgers has eleven brands that available in the United States. They are Classic Roast, including Classic “Red Can” and half caffeine medium roasts. Classic complements, including Gourmet Supreme, 100% Colombian, French Roast, Black Silk, Breakfast Blend, Simply smooth, flavored coffee, Folgers gourmet, instant coffee, singles, home café pods, cappuccino, Folgers flavors coffee enhancers, and Folgers Iced Coffee Coffee Drink Concentrates. One of the most famous variant is the Folgers 100% Colombian, Medium-Dark Roast Ground Coffee. Just like its name Folgers Colombian Coffee is made with 100% Colombian coffee beans that have a distinctive full bodied taste, which is rich, unique and flavorful. The coffee are delicately balanced and perfectly blended for an aroma that will instantly delight your senses. Folgers 100% Colombian Coffee are available in canister K-Cup Pods, Instant, individual single serve packets and other convenient format. Starbucks is an American based coffee company and coffeehouse chains that not only sell coffee drinks but also sell coffee related accessories or tools and ground coffee or tea leaves. Starbucks is very famous and their stores are spread all across the world to provide coffee drinkers their favorite beverages. Starbucks stores serve hot and cold drinks, whole bean coffee, microground instant coffee, espresso, café latte, full and loose leaf teas, such as the Teavana products. They also has Evolution fresh juices, Frappuccino beverages, la boulange pastries and snacks, such as chips and snacks. The Starbucks product that are we going to talk about today is the coffee ground. Starbucks has many varieties in the coffee ground section, such as iced coffee blends, Kenya, Starbucks Veranda Blend, Starbucks Willow Blend, Breakfast Blend, Colombia, Guatemala Antigua, House Blend, Pike Place Roast, Coffee Verona, Espresso Roast, Fair Trade Certified Italian Roast, Sumatra, Anniversary Blend, Guatemala Casi Cielo, Kati KATI Blend, Starbucks Tribute Blend, Starbucks Autumn Blend, Starbucks Christmas Blend, Starbucks Christmas Blend Espresso Roast, Three Region Blend and many more. The most famous ground coffee among them is the Breakfast Blend, which is designed for those who are not a morning people. The coffee ground is blend of Latin American beans, which has sparkling flavor and present a lighter character that commonly expect in espresso. Similar to many coffee, the strength is depending on the brewing process, the result may range from warm brown to dark. When comparing both of Folgers and Starbucks coffee, some may suitable with the taste of Folgers and some may suitable with the taste of Starbucks. We know that people have different taste and it is okay to have your own preference. Folgers Colombian is made from 100% Colombian bean and is full bodied bean. While Starbucks has sparkling flavor and is lighter-bodied and milder. For those who preferred stronger taste, you can choose the Folgers Columbian and for those who prefer lighter taste, you can choose Starbucks Breakfast Blend.